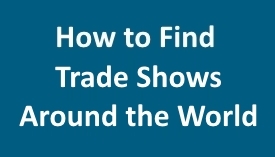 Industry events, conferences and trade show finder tools can be easily researched by accessing a number of websites that provide extensive event database listings and resources for exhibitors. These on-line resources provide information on conferences, trade fairs, exhibitions, conventions and special events across all industries. The databases can be searched alphabetically and according to industry category, country, city, venue, event size, and time of year. Nearly every major market around the globe hosts shows of significant size each year for specific organizations, causes and industries. Often convention centers in these areas have facilities to book multiple exhibitions nearly every week, which draw visitors/buyers from the near and far. Events featuring exhibitions and trade show displays represent big business for metropolitan areas that seek to utilize convention and conference facilities. In addition, hosting shows promotes incremental spending in markets and enhances a city's image. To find trade fairs and events in a given industry, contact trade associations and related professional organizations that can provide you with a comprehensive list of events, locations and dates. This information will help you evaluate if a given trade show represents a good match for your business needs, based on your target audience, trade show goals and budget.